In order to fulfill this obligation, one should drink most of a cup that contains at least a reviit. Some say one should only drink a Melo Lugmav (a cheekful) and some say one should preferably drink a Revi'it. When reciting Kiddush on Friday night, we say the words "ויהי ערב ויהי בקר" - "Vayihi erev vayihi boker" quietly before saying "יום הששי" Yom Hashishi. While we generally avoid reciting Pesukim in ways which differ from their presentation in the Torah, nonetheless we only say the second part, and don't say the first part of the Pasuk quietly because Chazal understand the words "טוב מאד" as a reference to death. However, there is debate whether one is allowed to say only part of a Pasuk so some are careful to add the rest of the Pasuk Vayar Elokim Et Kol Asher Asa Vehini Tov Meod, Veyihi Erev Vayihi Boker Yom Hashishi. The text of Kiddish during the day is just Borei Pri Hagefen. However, many have the minhag to say Pesukim before saying the Bracha. Some say two paragraphs, "Veshamaroo" and "Zachor" and others have the minhag to add another paragraph before these starting with "Im tashiv Mishabbos Raglecha" which are the Pesukim in Yeshaya which inlude the Pasuk from which the obligation of making Kiddush is derived. Many skip to the last sentence of "Zachor" starting with "Al cen berach" before saying the bracha on the wine. Someone who is sick and needs to eat before davening on Shabbat, according to Ashkenazim should recite Kiddush beforehand unless one doesn't eat a kezayit of mezonot within a kdei achilat pras, while according to Sephardim it isn't necessary. A person shouldn’t pour off to the other cups between the kiddush and drinking. If he is sick and worried about others drinking from his cup he can pour off but should make sure to leave a reviyit in the cup when he drinks. The one reciting kiddush doesn't have to pour off into their cups unless their cups are invalid for kiddush as they drank from them already. In such a case the one reciting kiddush can pour off from his cup into the others so that they are considered valid for kiddush. Those who are listening to the kiddush shouldn't drink until the making the kiddush drinks. However, if they each have their own cup they may drink without waiting. Those listening don't need to drink a melo lugmav and any amount is sufficient. Those listening to kiddush don't have to drink to fulfill their obligation but it is a mitzvah for them to drink. They don't need their own cup and may drink from the cup of kiddush. It isn't considered invalid for kiddush after the one reciting the kiddush drank and then they drink. If those listening want to have their own cup to fulfill this added mitzvah to drink wine after kiddush they may do so. If they do so they should have a cup that is valid for kiddush and we view it as though they are all reciting their own kiddush over their cup of wine. Some disagree. Some say that for kiddush by day those listening to kiddush must drink from the kiddush cup. Some authorities say that one may not use a plastic or paper cup for Kiddish, however, many authorities permit but agree that it's preferable to use a real cup. After the fact one fulfilled one's obligation even if one holds one shouldn't use a disposable cup. The cup of Kiddish should be rinsed out before being used if it isn't already clean. According to Kabbalah one should still clean out the cup in the inside and outside even if it is clean. Some say it is a nice practice to surround the kiddush cup with six small cups of wine. The minhag isn't concerned for this opinion. The kiddush cup should be full. If a person is afraid of spilling it is sufficient that it is almost full such as leaving it a quarter of an inch below the top. It's Rabbinically  forbidden to eat anything even water  before making Kiddish once the time for Kiddish has come. This applies to the nighttime and daytime Kiddush. If one doesn't pray or take Shabbat upon oneself early The time that the prohibition begins from Bein HaShemashot. Sephardim are lenient until the end of Ben Hashemashot (13.5 minutes). Ideally, one should say Kiddush as soon as one gets home from Shul on Friday night. One can say Kiddish before nightfall if one accepts upon oneself Shabbat early. If one needs to make Kiddush for someone else before Shabbat and one can't accept Shabbat then, some poskim allow making Kiddush then. See further on the Yatzah Motzei page. In the place where one made Kiddish one should make sure to have a meal there. This applies both for the nighttime and daytime Kiddush. Even though Kiddush should be recited immediately prior to the meal, if there is a halachic need related to the meal to delay it, it is permitted. For example, the Kiddush at the seder on Pesach is made much in advance of the meal but it is acceptable since the Maggid is a necessary prerequisite to the meal. In order to have Kiddish in the place where one eats and that the Kiddish is considered a proper Kiddish, one must eat at least a Kezayit of mezonot, bread, or a reviyit of wine. Even though theoretically this applies also at night, one should be strict at night not to rely on this. If someone is reciting kiddush in one room and someone else is hearing the kiddush in another room if the person listening to the kiddush is going to eat his meal in the room where he is that is considered kiddush in the place of the meal. The reason is that the one fulfilling his obligation of kiddush needs to be in the room where he is going to eat his meal and not where the person making kiddush is. The Mitzvah of Kiddush is unique in that women are obligated even though it is a Mitzvat Aseh She’Hazman Grama, based on a Talmudic derivation that since women are obligated by the prohibitions of Shabbat, they are also obligated in the positive commandments of the day. For Yom Tov Kiddush, many have the custom to sit, but some have the practice to stand. One should use a full cup of wine for Kiddush. Some say that grape juice is considered equally suitable as wine, while others disagree. Regarding grape juice from concentrate see Grape_Juice_and_Wine#Beracha. It is better to use red wine for Kiddush. If only white wine is available then one may make kiddush on it. If one has white wine it is preferable to use it for Shabbat day as opposed to Kiddush on Friday night. One may not use soda for Kiddish because soda isn't considered Chamar Medina. One should not say a breach acharona after kiddush, even though a reviit of wine was consumed, because saying birkat amazon at the end of the sueda covers kiddush. In Kiddush of Yom Tov if someone said Mikadesh Yisrael and didn’t add Ve’hazmanim he didn’t fulfill his obligation. In Kiddush of Yom Tov if someone said Mikadesh Hashabbat instead of Mikadesh Yisrael Ve’hazmanim he didn’t fulfill his obligation unless he fixed it within toch kdei dibbur. If someone said the Yom Tov Kiddush for the main text of the bracha which mentions Yom Tov in the middle and then concluded with Mikadesh Hashabbat one doesn’t fulfill his obligation. If you forgot to say Shehechiyanu you can say it afterwards anytime during the Yom Tov, for Pesach and Sukkot until the end of the 7 days. In Kiddush of Yom Tov that fell out on Shabbat includes both Shabbat and Yom Tov. If one only said the kiddush of Shabbat or Yom Tov one doesn’t fulfill one’s obligation. If one said the middle of the kiddush correctly and in the conclusion he made a mistake and only mentioned Shabbat according to many poskim one fulfilled one’s obligation. If one said the middle of the kiddush correctly and in the conclusion he made a mistake and only mentioned Yom Tov according to many Ashkenazic poskim one didn’t fulfill one’s obligation but according to Sephardim one did fulfill one’s obligation. If one mentioned Yom Tov in Kiddush but not the specific one there’s a dispute if one fulfilled one’s obligation. ↑ Rambam Sefer Hamitzvot Aseh 155, Chinuch 31, Smag Aseh 29, Sefer Hamitzvot of Rav Saadia Gaon Aseh 33 all count the mitzva to sanctify the shabbat with words based on this pasuk. Rambam (Hilchot Shabbat 29:1) writes that there is a positive biblical commandment to remember Shabbat based on the pasuk "זכור את יום השבת לקדשו" (Shemot 20:7). In 29:4, he writes that the primary time for the mitzvah is Friday night. Kitzur Shulchan Aruch 77:1 rules like the opinion of the Rambam. [However, it seems that Tosfot (Nazir 4a s.v. My Hee; first opinion) holds that the mitzvah of Kiddish is Derabbanan and the pasuk of Zachor is only an asmachta]. Tosafot Pesachim 106a “zochrayhu” states two opinions: 1) the cup of wine is diRabanan; 2) the cup of wine is diorayta, but the drinking is dirabanan. ↑ Pesachim 106a states that the Kiddish is supposed to be said over a cup of wine. Tosfot (s.v. Zochrayhu; first opinion) and Rambam (Hilchot Shabbat 29:6) write that saying Kiddish over the cup of wine is Derabbanan. Tosfot's second opinion holds saying Kiddish over a cup of wine is Deoraittah, but drinking it is Derabbanan. ↑ Magen Avraham 271:1 writes that since the Rambam and Tosfot hold that the Deorittah part of Kiddish is that it is stated orally, one should be able to fulfill this obligation with one's Maariv prayer in Shul. This is quoted as halacha by the Bear Hetiev 271:2. However, there is a great discussion in the achronim and many argue on the Magen Avraham (Mishna Brurah 271:2 (based on the Tosfet Shabbat 271:3) argues that since one doesn't have intention to fulfill the obligation of Zachor, the prayer in shul doesn't fulfill the obligation of Kiddish). There is a dispute whether a women's lighting Shabbat candles can fulfill Kiddish Deoritta, Sh"t Mishneh Halachot 7:37 holding that it can fulfill the Deoritta obligation, while Sh"t Az Nidabru 12:1 strongly disagrees. What is the minimum amount of wine one should drink for Kiddish? Shulchan Aruch 271:13 writes that for kiddush one must drink a Melo Lugmav, which is a cheekful and is the equivalent of the majority of a Revi'it. Kitzur Shulchan Aruch 77:9 agrees. Kaf HaChaim 271:83 and Or Letzion (vol 2, 20:22) write that it's preferable to drink a complete Reviyit. On the other hand, Beiur Halacha 174:6 s.v. VeChen writes that since there's a dispute whether the Birkat HaMazon will exempt the Bracha Achrona of the wine, one should preferably drink only a Melo Lugmav and not a Reviyit. Then he ends off by referencing the Shulchan Aruch's ruling in 190:3 and says that one should have intent that the Birkat HaMazon will exempt the wine before the meal. Additionally in opposition to the Or Letzion, the Brisker Rav (Chametz Umatzah 7:9 s.v. vhanireh cited by Dirshu 472:35) explains that there's no initial mitzvah to have a full reviyit for every kos shel bracha, it is a unique halacha for the four cups of the seder. Yalkut Yosef (Shabbat vol 1, p 274) simply writes that one must drink a Melo Lugav and doesn't say it's preferable to drink a Reviyit. See also Shulchan Aruch 190:3 who writes that because there is a dispute whether one is obligated to make a Bracha Achrona for a Kezayit or a Reviyit of wine, one shouldn't enter into that dispute and for a Kos Shel Bracha, when one needs to drink more than a Melo Lugmav, one's only option is to drink more than a Reviyit. Kaf HaChaim 271:84 quotes the Pri Megadim who explains that this doesn't apply to Kiddush before a meal since the Birkat HaMazon exempts the wine from a Bracha Achrona. Mishna Brurah 272:30 rules that the obligation to have most of a Revi'it applies regardless of which drink you use for kiddush. Rav Tzvi Pesach Frank in Har Tzvi 1:159, however, says that since the Taz (210:1) holds that one would be obligated to say a beracha acharona on less than a Revi'it of liquor because less than that already is considered to be significant enough for a beracha acharona, the same would apply for how much you need to drink for kiddish. In regards to Bracha Achrona, Mishna Brurah 190:14 based on the Magen Avraham 190 also writes that there's no difference between wine and other drinks in opposition to the Taz's opinion in that regard as well. ↑ Haggadah Kol Dodi (Rabbi Dovid Feinstein, 5730, pg 4) writes that the Revi'it for kiddush on Shabbat (using the method of measuring finger-widths) should be 4.42 oz. ↑ The Gemara Pesachim 100b discusses the custom to recite kiddush on Friday night in shul. The Tur 269 writes that saying Kiddush in shul was only established in order to fulfill the obligation of Kiddush for the guests who would eat their meal in shul. He says that nowadays that guests don't eat their meal in shul one shouldn't say Kiddush in shul. The Beit Yosef 269 quotes the Rabbenu Yonah, Ran, and Rashba who defend this practice of saying Kiddush in shul even if guests don't even their meal in shul. Additionally, the Rambam (Sh"t Harambam 37) writes that this minhag shouldn't be discontinued because all establishments that the rabbis made must remain even if the reason no longer applies. Rashba responsa 1:37 and Maharam Chalavah Pesachim 101a agree. Nonetheless, the Bet Yosef writes that the more proper minhag is not to say Kiddush in Shul. Shulchan Aruch 269:1 rules that some have this practice to say Kiddush in shul, but its better not to. Mishna Brurah 269:5 writes that the common minhag is to say Kiddush in shul and one shouldn't uproot it. Yalkut Yosef 269:2 writes that if there are some in shul who will not say Kiddush at their homes at all, it is not just justified but even encouraged to say Kiddush in shul, but otherwise a shul who doesn't yet have that and doesn't yet have an established minhag, shouldn't say the kiddush in shul. He continues that whatever shul already has the minhag to say it, they should not be stopped because this minhag has its basis. Sh"t Yachin Uboaz 118 writes that that the Rashbetz wouldn't answer amen to the kiddush in shul because of the safek beracha livatala. ↑ Shulchan Aruch 269, Mishna Brurah 269:1, Yalkut Yosef 269:2. The Magen Avraham 269:1 explains that it is permitted to have the child drink the kiddush wine even though his meal isn't there and it is like eating before kiddush. He explains it is permitted for a child to eat before kiddush for several reasons: 1) Since eating before kiddush is a prohibition implied from a mitzvah it isn't an issue of feeding something forbidden to children. (Yalkut Mefarshim on Ran Yoma 3a agrees.) 2) Since the prohibition is only related to time and not intrinsic to the food it is permitted to feed to children. (Meor Yisrael Ymoa 78b agrees.) 3) According to the Geonim it is permitted to just have the cup of kiddush without the meal there and for children that is sufficient to rely upon. 4) According to the Rashba and Ran it is permitted to feed a child a rabbinic prohibition. ↑ The Ran on Gemarah Pesachim 106a says that the Kiddish of the night is Deoritta while that of the day is Derabbanan. ↑ Rambam (Hilchot Shabbat 29:7) writes that the order of Kiddish is Vayichulu (which are pesukim said based on Minhag), the Borei Pri Hagefen and then Mikdash HaShabbat (the text of which can be found in Rambam 29:2). ↑ Tanit 27b, Megillah 22a. "כל פסוקא דלא פסקיה משה אנן לא פסקינן". ↑ Rama 271:10, Levush 271:10, Aruch HaShulchan 271:25, Chatom Sofer OC 10. Chatom Sofer OC 1:51 explains the minhag is based on the fact that we want to mention yom hashishi before vayichulu hashamayim since there’s an acrostic of Hashem’s name of the first letter of each of those four words. But since we don’t want to mention only two words from a pasuk since it is meaningless we include a whole phrase. However, we don’t want to say the whole pasuk since the midrash says that there’s a reference to death in the beginning of the pasuk. Rav Aviner Nefesh Harav (p. 159) quotes Rav Soloveitchik as having the practice to say the beginning part of the pasuk quietly to himself. He also cites this as the practice of the Steipler (Orchot Rabbenu v. 1 p. 109). ↑ The Gemara Pesachim 106a states that the primary Kiddish is at night, but there's also a Kiddish of the day. Even though it seems to be Deorittah as the gemara learns it from a pasuk, the Rishonim agree that the pasuk is only an asmachta (Ravad and Magid Mishna (Hilchot Shabbat 29:10), quoted by Bear Heitiv 289:2) and the obligation of Kiddish during the day is only Rabbinic. The gemara concludes that the text of such a Kiddish is just Borei Pri HaGefen. Rambam (Hilchot Shabbat 29:10) and Shulchan Aruch 289:1 rule this as halacha. ↑ Rambam (Hilchot Shabbat 29:10) and Shulchan Aruch 289:1 rule that since there's an obligation to make Kiddish it's forbidden to eat anything before Kiddish just like the Kiddish of Friday night. ↑ Mishna Brurah (Biur Halacha 289:1 s.v. chovat) and Igrot Moshe OC 2:26:2 write that someone who is sick and needs to eat before davening on Shabbat should make kiddush unless he doesn't need to eat pat haba bekisnin. Piskei Teshuvot 289:8 note 63 writes that the best option is for the sick person not to have a kezayit of pat haba bekisnin within a kedi achilat pras which wouldn't obligate kiddush. ↑ Yabia Omer OC 8:31 and Or Letzion 2:20:14 write that someone who is sick and needs to eat before davening on Shabbat does not need to make kiddush. See also Kaf Hachaim 276:28 who is lenient in extenuating circumstances. See Chazon Ovadia (Shabbat v. 2 p. 149) where Rav Ovadia recommends that a sick person who needs to eat bread or pat haba bekisnin before davening should recite kiddush. Piskei Teshuvot 271:32 quotes the Mishnat Yosef 4:35 who says that initially one shouldn't pour off before drinking because one should drink from a cup with a reviyit and also so that it shouldn't look like a disgrace to the mitzvah (bizuy mitzvah, see Mishna Brurah 296:4 and Eliya Rabba 271:23). However, if he’s sick he can pour off some and then drink from the cup which still has a reviyit. Rav Hershel Schachter (Brachot Shiur 92 min 44) agreed that one shouldn’t pour off so much that there’s not a reviyit left before you drink. He holds like the Magen Avraham as will be explained. Should the cup one drinks from have a reviyit? Tosfot Pesachim 105b s.v. shema writes that one must drink from a cup that has a reviyit and not pour off some of the cup into another cup and drink. Agudah Pesachim 10:84 and Ritva Pesachim 105b s.v. shema agree. Magen Avraham 271:24 rules like Tosfot. Mishna Brurah 271:51 agrees. Shulchan Aruch 271:11 seems not to hold like Tosfot but see Eliya Rabba 271:23 who defends Shulchan Aruch but also accepts Tosfot. Korban Netanel Pesachim 10:200 writes that in fact the Rosh, Rabbenu Yerucham, and Shulchan Aruch disagree with Tosfot and you don’t have to drink from a cup with a reviyit. Netiv Chaim 271:11 agrees. Rabbi Akiva Eiger Pesachim 105b discusses whether the proof of the Korban Netanel is conclusive. ↑ The Levush 271:14 writes that those listening should drink a melo lugmav. However, the Maggid Mishna Shabbat 29:7 writes that those listening only need to drink a bit and not melo lugmav. The Taz 271:17, Eliya Rabba 271:29, and Mishna Brurah 271:71 follow the Maggid Mishna. ↑ Eruvin 40b and Pesachim 108b imply that only the one drinking needs to drink and no one else but Pesachim 106a and perhaps 108b imply that everyone listening should drink. The Rosh Pesachim 10:16 writes that although each person listening to kiddush doesn't need to drink wine to fulfill his obligation, there is nonetheless an added mitzvah to do so. Maharam Chalavah Pesachim 101a holds those listening don't need to drink. Tosfot Pesachim 99b s.v. lo originally assumes that those listening to the kiddush don't need to drink but afterwards questions that assumption. The Rambam Shabbat 29:7 implies that there is an obligation for everyone to drink. Maggid Mishna 29:7 just adds that those listening don't need to drink a melo lugmav. Shulchan Aruch OC 271:14 rules like the Rosh that as long as the one reciting kiddush drinks that is sufficient for everyone to fulfill their obligation but it is a mitzvah for them to drink. Mishna Brurah 271:83 agrees. 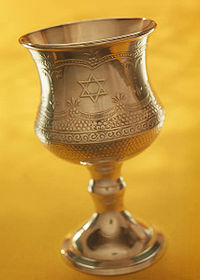 ↑ Shaar Hatziyun 271:89 explains that even though if those listening had their own cup they should ensure that the cup should be valid for kiddush and not drunk from beforehand, however, if they are drinking from the kiddush cup after the one who recited kiddush drank it isn't considered invalid as their drinking is considered part of the original drinking of the one who recited kiddush. ↑ Rosh Pesachim 10:16 writes that the wine in each person's cup has to be fixed and not drunk from beforehand in order for them to use it for drinking at kiddush even though they aren't reciting the kiddush. He explains that since they are listening to kiddush and going to drink wine from their own cup it is considered as though they are reciting their own kiddush over their own cup. If so that cup should be valid for kiddush. Tosfot Pesachim 106a s.v. hava, Tosfot Brachot 47a s.v. ein, Rashba Brachot 47a s.v. amar, Tur 182:4, and Ohel Moed 6:6 cited by Bet Yosef 182:2 agree. The Shulchan Aruch OC 271:17 accepts the Rosh. The Tiferet Shmuel on Rosh Pesachim 10:15:10 seems to have another understanding of the Rosh in which he assumes that those who are listening to the kiddush and have their own cups don't need their cups to be valid for kiddush and may be drunk from beforehand (like the Raah). However, the Divrei Chamudot Pesachim 10:15:36 understood the Rosh as above. ↑ The Raah cited by Bet Yosef 182:4 writes that those listening don't have to have valid cups for kiddush. The Shulchan Aruch 182:4 cites that opinion as a minority view. ↑ Rav Schachter Inyonei Sefirat Haomer 5776 towards the very end quoted the Torah Temimah, Netsiv, and Rav Velve Soloveitchik that one doesn’t fulfill one’s obligation if one doesn’t drink wine at the kiddush of the day specifically since it really is only a birchat hanehenin and not a bracha of a mitzvah. However, in Brachot Shiur 92 (min 23) he quoted that Rav Chaim was upset with this chiddush of the Netsiv and not everyone has to drink at the daytime kiddush. Teshuvot Vehanhagot 3:243 cites this dispute between the Brisker Rav and Rav Chaim. ↑ The Gemara Brachot 28b writes that the halacha doesn’t follow Rav Huna who says that it’s forbidden to taste any food before praying Mussaf. The Tur 286:3 writes that even though we don’t hold like Rav Huna we only permit have a snack but a meal is forbidden. The Bet Yosef quotes the Raavad, Rashba, and perhaps the Rabbenu Yerucham who agree. S”A 286:3 writes that it’s forbidden to eat a meal before praying Mussaf but it’s permissible to have a snack. The Magen Avraham 286:2 writes that the snack is the same as before Mincha where S”A 232:3 writes that one may have a KeBaytzah of bread and a lot of fruit but not more. Kitzur Shulchan Aruch 77:15 agrees. See Rav Mordechai Eliyahu's comment on Kitzur Shulchan Aruch 77:15 where he writes that we only rely on this in situations of pressing need. ↑ Sh"t Igrot Moshe O"C 3:39 forbids using a plastic or paper cup as they aren't considered a nice cup and it's worse off than a broken cup (which is forbidden by Shulchan Aruch 183:3. Mishna Brurah 183:11 says that even if it is just the base that is cracked one should still be strict.) The Radiance of Shabbos (page 44) points out that this doesn't depend on the quality of the plastic at all. Rav Hershel Schachter (Brachot Shiur 101 min 25-30) agrees with Rav Moshe. However, Sh"t Tzitz Eliezer 12:23 differentiates between a cup that would be used for hot liquids and could be reused and one that's ruined after it's first use. Even if one personally doesn't reuse it, it is still considered a kli. This is true for kiddush, havdala, and netilat yadayim. Sh"t Beer Moshe 5:55 on the other hand, only allows cup that are commonly reused and therefore only permits plastic cups and not paper cups, or small shot glasses because those are rarely reused. Sh"t Az Nidabru 6:49 is the most lenient allowing any disposal cup, however, it's still preferable to use a better cup as a hidur mitzvah. Shevut Yitzchak (vol 1, 4:5, pg 48) in name of Rav Elyashiv and Chazon Ovadyah (Shabbat vol 2 p. 56) concur with the lenient opinion. See further: Rabbi Aryeh Lebowitz on yutorah.org. Although many poskim, say that using two plastic cups doesn't help at all, see Rav Dov Lior for the explanation of that practice, though he writes that he doesn't necessarily think that it helps the issue. ↑ Mishna Brurah 183:10 writes that the entire concept of having a cup for kiddush that is complete is important initially but after the fact isn't critical and one fulfills one's obligation. Therefore, Rav Hershel Schachter (Brachot Shiur 101 min 25-30) explained that Rav Moshe who invalidated a disposable cup for kiddush because it is like it is already broken would agree that after the fact one fulfilled one's obligation. Rashba 51a s.v. ha writes that if a person doesn’t have one of the four major rules of a kos shel bracha a person doesn’t fulfill their obligation, the others are enhancements initially. Meiri 51a s.v. asara quote some who said that they are all only critical initially. Mishna Brurah 183:10 implies that we follow the Meiri. Maaseh Rav n. 86 follows the Rashba that it would prevent fulfilling one's obligation. ↑ The Gemara Brachot 51a establishes that the kos shel bracha should be cleaned on the inside and outside before it is used. Shulchan Aruch OC 183:1 codifies this gemara but adds that it is only necessary if the cup is dirty but if it is clean it doesn't need to be cleaned out. Chaye Adam (Shabbat 6:13) agrees. Mishna Brurah 183:3 writes that it is proper to clean it out unless it is completely clean. ↑ Gra in Maaseh Rav n. 174 states that it is nice to have six small cups surrounding the main kiddush cup. His reason is that this is the practice of Itur of the Gemara Brachot 51a and even though the gemara says we don't have that practice the gemara only meant that it isn't critical but it is still a nice practice. Kaf Hachaim 183:3 writes that it isn't our practice since we try to follow the other explanation of Itur is having talmidei chachamim around the table, which isn't always possible but when it is that's the main method to add significance to the kiddush. ↑ Mishna Brurah 271:11 writes that the prohibition is only Rabbinic. ↑ Maggid Mishna (Hilchot Shabbat 29:5) explains that the Rambam holds drinking water before Kiddish is permitted, while the Rashba (Sh"t 3:264) forbids it. Hagahot Maimon 29:5 in name of Maharam as well as the Tur 271:4 also forbid. Bet Yosef says that the Rambam is unclear and may hold that even water is forbidden. Shulchan Aruch 271:4 rules that even water is forbidden. ↑ Pesachim 106b records a dispute whether one who tasted food before Kiddish can still make Kiddish. Bet Yosef 271:4 implies from there that Lechatchila, it's forbidden to eat or drink before Kiddish. Rambam (Hilchot Shabbat 29:5), Tur and Shulchan Aruch 271:4 all rule that it's forbidden to eat before making Kiddish. ↑ Magen Avraham in name of the Bach writes that it's forbidden to eat before making Kiddish if one accepted Shabbat early. ↑ Magen Avraham 271:5 writes that one is allowed to accept Shabbat early, and then make Kiddish to permit eating, all before praying Arvit. Beir Heitev 271:4 quotes this as halacha. Kitzur Shulchan Aruch 77:4 and Mishna Brurah 271:11 limit the permit to eat to when one is more than a half hour before nightfall as is the halacha everyday of not eating before Arvit. ↑ Magen Avraham 271, Mishna Brurah 271:11 and Ben Ish Chai Beresheet 17 write that the prohibition begins at Bein HaShemashot. ↑ Rav Yitzchak Yosef (Motzei Shabbat Shemot 5779 min 12) explained that there's many reasons why it is permitted to drink water after accepting Shabbat during Ben Hashemashot. 1) The acceptance of Shabbat of an individual isn't a full acceptance that would make everything forbidden. 2) Ben Hashemashot might be like the day, especially since we might follow Rabbi Yose who holds that it is day until the end of Ben Hashemashot. 3) According to Rabbenu Tam it is the day. 4) According to the Rambam one can drink anything besides wine before Kiddush. ↑ Magen Avraham 271:5 writes that rinsing out one's mouth is permitted as it isn't called drinking. Bear Hetiev 271:4 and Mishna Brurah agree. However, Ben Ish Chai Beresheet 17 is more stringent and only permits if one was fasting and only during Bein HaShemashot. ↑ Magen Avraham writes that Kiddish can be made during the day if one accepts upon oneself Shabbat early. Many achronim including Kitzur Shulchan Aruch 77:2 and Mishna Brurah 271:11 concur. ↑ Minchat Shlomo 1:3 allowed it non-regularly. Rav Yitzchak Yosef (Motzei Shabbat Shemot 5779 min 43) and Tzitz Eliezer 14:25 allowed it. They cite Rabbi Akiva Eiger who was unsure about this. ↑ Ben Ish Chai Beresheet 19 writes that one could argue that according to the Magen Avraham, once one prayed on Shabbat the obligation of Kiddish is only Derabbanan and whenever there is a doubt about a Derabbanan obligation one may be lenient (Safek Derabbanan Lekula). If this was the case, one should say that if it is Bein HaShemashot one no longer needs to say Kiddush. However, the Ben Ish Chai rejects such an argument because some commentators limit the Magen Avraham to a case where one doesn't have wine or one specifically had Kavana in davening to fulfill one's obligation. Therefore, the Ben Ish Chai rules that one can still make Kiddish during Bein HaShemashot with a Bracha because of the rule Safek Deorittah LeChumra just like if there's a doubt concerning Birkat HaMazon. Halichot Olam (vol 3, pg 25-7) agrees. However, the Mishna Brurah 271:39 (Shaar Hatziyun 47) rules that if one did say Tefillot Shabbat and it's Bein HaShemashot, one should make the bracha without Shem UMalchut. See Rabbi Mansour on Dailyhalacha.com. Tur 271:12 quotes Rav Amram Goan (Siddur vol 2, Siman 17) who wrote that one should make Kiddish on wine and then wash for bread, however, if one washed first one should make Kiddish on bread in accordance with Rav Bruna in Pesachim 106b. Rambam (Hilchot Shabbat 29:9-10) and the Ran in explaining the Rif (22a) concur. The Maharam MeRotenburg's (quoted by the Tur 271:12) practice was to make Kiddush before washing. Shulchan Aruch 271:12 rules that one should make Kiddush and then wash, however, if one washed first one should make Kiddush on the bread. Kaf HaChaim 271:76 adds that the Arizal (Shaar Kavanot 71c) agrees because the order should be kept as Kiddish being the completion of prayer and washing as the start of the meal. Gra 271:12, Maamer Mordechai 271:16, and Yalkut Yosef (Shabbat vol 1 pg 273) concur with Shulchan Aruch. Therefore, Sephardim shouldn't change from the ruling of Shulchan Aruch even Bedieved. However, the Kaf HaChaim 271:77 argues that Bedieved one should say Kiddish on wine because one has what to rely on. ↑ However, the Rashbam (Pesachim 106b), and Baal HaMoar (Pesachim 21b s.v. Amar Rav Bruna) explain the gemara differently than the Ran and say that lechatchila one should make Kiddish first, however if one doesn't one can still make Kiddish on wine. Rabbenu Tam (Pesachim 106b s.v. Mekadesh) and the Ri (Pesachim 106b s.v. Zimnin) hold that even Lechatchila one should wash before making Kiddish on wine. Hagahot Maimon 29:100, Sh"t Rashba 1:752, Rokeach (115), and Mordechai (Pesachim 106b; pg 37c) side with Rabbenu Tam and Ri. Such was the minhag of the Rosh (quoted by Tur 271:12) and the minhag of Ashkenaz as writes the Rama 271:12. The Taz 271:14 and Chaye Adam (Shabbat 6:12) rule that the Rama is only bedieved. Therefore, Mishna Brurah 271:62 writes that since many achronim side with Shulchan Aruch and one satisfies all opinions one should make Kiddish first, however Bedieved one can rely on the Rama to make Kiddish on wine if one did in fact wash first. Kaf HaChaim 271:77 adds in the name of the Bach that if one didn't make the bracha on Netilat yadayim one should make Kiddish on wine and then rewash so that one doesn't loose the Kiddish over wine. ↑ See previous note. Rama 271:12 writes that such was the minhag of Ashkenaz to wash before Kiddish. The Bet Yosef 271:12 comments that he saw some Sephardim who had such a practice but sternly disagreed based on the Rif and Rambam. ↑ Magen Avraham 271:26 in name of Hagahot Mordechai (it seems that he means Mordechai pg 37b), Bach 271:11 (s.v. VeleInyan) distinguish between the one making Kiddish and the other members of the family for whom Kiddish won't be an interruption. Kaf HaChaim 271:79 argues that there's no difference between the one making Kiddish and the other family members. ↑ Magen Avraham 271:27 writes that even according to Rabbenu Tam (Pesachim 106 s.v. Mekadesh) that Lechatchila one can wash before Kiddish, explains that Bet Hillel (Brachot) says to make Kiddish first in the case where one has to dilute the wine becasue diluting wine takes precision and is definitely an interruption. Magen Avraham adds that according to the stringent opinion in Shulchan Aruch 166:1 (which is the Tur based on the Yerushalmi) one should be strict not to make any interruption. The Magen Avraham is brought as halacha by the Tosfet Shabbat 271:34 and Kaf HaChaim 271:78. ↑ Shmuel in Gemara Pesachim 101a says that one should only say Kiddush in the place where one is going to have a meal. The Rosh (Pesachim 10:5) says that this is based on the pasuk "VeKarata LeShabbat Oneg" which Chazal explain with "Kriyah" as a reference to Kiddush and "Oneg" to the meal and so the pasuk means, in the place of Oneg one should have Kriyah. Shulchan Aruch 273:4 and Kitzur Shulchan Aruch 77:14 codify this as the halacha. ↑ Preferably, Rama 273:3 writes that one should make one's meal immediately after Kiddish. Mishna Brurah 273:12 explains that preferably, one should eat one's meal right after Kiddish without waiting. However, Bedieved, Mishna Brurah 273:12 and Piskei Teshuvot 273:3 based on Aruch HaShulchan 263:1 write that one shouldn't make a new Kiddish even if one had a long break or made a change in place and returned to the place of the Kiddish. On the other hand, if one didn't have in mind to eat immediately and then made an interruption, Mishna Brurah 273:14 writes that a new Kiddush is needed. Halichot Olam (vol 3, pg 3) defines this interruption as 72 minutes. ↑ Rav Ovadia Yosef in (Kol Sinai Tevet 5724 p. 15) writes that Maggid doesn't make the Kiddush before the meal not adjacent to the meal because the Maggid is necessary for the meal as we need to speak about the Matzah (Lechem Shonim Alav Devarim Harbeh). Halichot Shlomo of Rav Shlomo Zalman Auerbach (Moadim v. 2 p. 248 9:14) agrees and explains that the Maggid is intrinsically part of the meal and such was the establishment of chazal. See Rav Chaim Palagi Haggadah regarding how Maggid is an extension of Kiddush (like the Rif cited by Avudraham why there's no bracha on Maggid since Kiddush already fulfills the mitzvah of Maggid). ↑ Shulchan Aruch 273:5 writes in name of the Geonim that one can fulfill the obligation to eat in the place of where one makes Kiddish by eating bread or wine. Magen Avraham 273:10 and Mishna Brurah 273:21 rule that a Kezayit is needed to fulfill this obligation. Mishna Brurah 273:25 comments that certainly mezonot fulfills the obligation as it's more significant than wine. Mishna Brurah 273:25 writes in name of Hagahot Rabbi Akiva Eiger and Tosefet Shabbat that wine doesn't fulfill one's obligation according to many and so one should only rely on this in cases of need. Piskei Teshuvot writes that it seems that there's a dispute between the Magen Avraham 273:11 and the Shaarei Teshuva 289:1 whether one can fulfill one's fulfill with mezonot that's not Pat HaBah Bekisnin. The Mishna Brurah 273:25 holds like the Magen Avraham and one can fulfill one's obligation by having any mezonot. Shemirat Shabbat KeHilchato 52:24, Sh"t Az Nidabru 8:31, Kiddush KeHilchato (pg 195), Sh"t Or Letzion (vol 2, 20:28), and Yalkut Yosef (Shabbat vol 1 pg 196; Halichot Olam (Vol 3, pg 1)) agree. ↑ Rav Ovadia Yosef in (Kol Sinai Tevet 5724 p. 13) writes that since some disagree with the geonim we shouldn't rely on them at night when Kiddush is Biblical. ↑ Maharam Chalavah Pesachim 101a explains that they used to make kiddush in shul and people in a nearby room would hear the kiddush and fulfill their obligation and eat there. It is considered kiddush in the place where they're going to eat since they're fulfilling their obligation and they're the ones eating. The location of the making kiddush doesn't impact that. Tosfot Pesachim 101a s.v. dochlu implies otherwise. Nonetheless, the Bet Yosef 273:6 cites the Rabbenu Yerucham, Smag, and Hagahot Maimoniyot who agreed with Maharam Chalavah. Shulchan Aruch OC 273:6 holds like Maharam Chalavah. Rabbi Akiva Eiger 273:2 explains that those listening to the kiddush are like making kiddush themselves. ↑ Since women are obligated in Kiddish on a biblical level, they can definitely make Kiddish for themselves. Additionally since a man is obligated, a women can fulfill her obligation with the man's Kiddish as they both have a Deorittah obligation. According the Magen Avraham that one fulfills the Deorittah obligation in prayer, if a man and women have both already prayed, they can fulfill each other's obligation since they have equal obligations. However, if the man prayed and the women didn't, then the man is obligated on a Rabbinical level and the women is obligated on a Biblical level. If so, Rav Yechezkel Landau in Dagul Mirvavah 271:2 asks, whether the women can't fulfill her obligation with the man's reading, or perhaps she can because nonetheless, men are able to fulfill the obligation of others using Arevim Zeh LaZeh (the side is also not definite because the Rosh (Brachot 3:13 last line) writes that women aren't included in Arevim). He leaves it unanswered and the Kitzur Shulchan Aruch 77:4 writes that it's preferable that women say the kiddish along with the one making Kiddish so that they are fulfilling their own obligation. However, the Sh"t Rabbi Akiva Eiger 1:7 argues that certainly women are included in Arevim Zeh LaZeh (and explains that the Rosh was talking about mitzvot that women are exempt from) and so a man with a Derabbanan obligation can fulfill a woman's obligation even if she is has a Deorittah obligation. Aruch HaShulchan 271:6 and Chazon Ovadyah (Shabbat vol 2 pg 24) concur. ↑ Shulchan Aruch 271:2 writes that since women are obligated in Kiddish on a Deorittah level, they can fulfill the obligation of a man who also has such an obligation. Even though the Maharshal and Bach argue with this, the Taz, Magen Araham, Gra, Mishna Brurah 271:4 all agree with Shulchan Aruch that a women can fulfill the obligation of a man. Nonetheless, Eliyah Rabbah, Derech Chaim, and Mishna Brurah 271:4 write that it's preferable that a women not fulfill the obligation of men not in her family because it's not entirely appropriate. (2) Reasons one should sit: Mishna Brurah 271:46 brings the reason of the Kol Bo that one should sit as a part of Kiddish BeMakom Sueda making Kiddish in the place one will eat, and the reason of the Gra that because sitting represents an established setting and one is able to fulfill the obligation of others only is such a setting. Mishna Brurah extrapolates from the Gra's reasoning that even those who listen should preferably sit, and if they are not only standing but even moving here and there during Kiddish one certainly doesn't fulfill his/her obligation. Chaye Adam (Shabbat 6:13) writes that it's preferable to sit during Kiddish so one can see the cup (like the Rama writes 271:10 that one should look at the cup) and one's family as one makes Kiddish. (3) Practices: Therefore, Shulchan Aruch 271:10 rules that one should stand for Vayichulu implying that one should sit for the rest of Kiddish. However, Arizal (quoted by Aruch HaShulchan 271:21) held one should stand for Kiddish out of respect for the Shabbat queen (similar to the reason Ashkenazim stand for Havdalah, see Mishna Brurah 296:27). Lastly, Rama 271:10 writes that one is permitted to stand for the entire Kiddish, but it's preferable to sit for Kiddish. Sh"t Igrot Moshe 5:16 writes that even the Rama only writes that it's permissible to stand for Kiddish but preferably one should sit, and so if one doesn't have a custom one should follow the Shulchan Aruch. ↑ Shulchan Aruch 271:10 rules that one should stand for Vayichulu. Mishna Brurah 271:45 explains that the one should stand for Vayichulu because it acts as a testimony which in court would require one to stand. Rama 271:10 writes that the Minhag was to sit for Vayichulu except for the beginning of Vayichulu (during the words of Yom HaShishi Vayichulu HaShamayim because the first letter of those words spell Hashem's name). Mishna Brurah 271:47 explains that one can sit for Vayichulu because once one stood while it's said in Shul it can be said seated during Kiddish. Nonetheless, Mishna Brurah 268:19 writes that the minhag is like Shulchan Aruch to stand for Vayichulu. See further Rabbi Lebowitz's article on [download.yutorah.org/2009/1109/735392.pdf yutorah.org]. ↑ Rav Moshe Shternbuch (Teshuvot V’hanhagot #254) writes that even those who stand for Friday night Kiddush should sit for Shabbat day Kiddish because the reason of standing for Vayichulu and continuing doesn't apply as there is no Vayichulu, nor is there a Shabbat queen to greet. ↑ Sh"t Igrot Moshe 5:16 writes that the only reason to stand the entire Kiddish on Shabbat is because once one is standing for Vayichulu one can continue standing for the rest of the Kiddish, however since there's no Vayichulu on Yom Tov one must sit according to all opinions. ↑ Gemara Brachot 51a, Shulchan Aruch 271:10. Rav Schachter ("Hilchos Shabbos 4", min 33-5) based on Rabbenu Yonah holds that if the cup is two thirds full it is considered full. ↑ Yachave Daat 2:35 writes that one can use grape juice for kiddush, and Hacham Ovadia's opinion is also found in Chazon Ovadia, Hilchot Shabbat, Chelek 2, Page 81. Or Letzion 2:20:18, Yesodei Yeshurun 3:214-215 and Mishneh Halachot 13:38 agree. Rav Schachter ("Hilchos Shabbos 4", min 90-2) quotes Rav Moshe as allowing grape juice for Kiddush but saying it is best to avoid the dispute. An article on TorahLab.org writes that the majority of poskim hold grape juice is fit for Kiddush. ↑ Shemirat Shabbat Kehilchata 53:2 citing Rav Shlomo Zalman Auerbach concludes that preferably one shouldn't use grape juice for kiddush. Laws of Brachos p. 316 writes that one shouldn't use grape juice for kiddush. ↑ Shulchan Aruch 272:9 writes that some say one should say kiddush on chamar medina, some say not to say kiddush at all, and some who say that bread should be used for kiddush because of its importance. Rama 279:2 comments that the minhag is like the last opinion. Kaf HaChayim 272:50 and Yalkut Yosef 272:16 write that Shulchan Aruch holds like the last opinion. Mishnah Brurah 272:28 says to put your hands on the challah. Rav Avigdor Neventzahl in his commentary on Mishna Brurah (Biyitzchak Yikare 272:28) says that one should actually hold the challah. ↑ Shulchan Aruch 289:2, Mishna Brurah 289:10. The logic behind not using bread for kiddish during the day is explained by Mishna Brurah 272:31 that if one were to recite the daytime kiddish over bread, it would be the same procedure as if he wasn't saying kiddush at all. Therefore, to make it apparent that we are saying kiddish also, we say a beracha that wouldn't normally be recited, even if that is a shehakol. As for the definition of chamar medina Mishnah Brurah 272:24 says that even beer is only permitted in a place where it is a common drink. Mishna Brurah 272:25 prohibits the use of milk or oil, and Mishna Brurah 272:30 permits the use of liquor. Rav Avigdor Neventzahl in Biyitzchak Yikare footnote 25 says that according to Rav Shlomo Zalman Auerbach milk is not allowed even in places where it is commonly used like Switzerland. He also says that juice, tea, or coffee maybe permitted but soda is definitely not because it is just like water. Rav Moshe Feinstein in Iggerot Moshe OC 2:75 defines chamar medina as something you would serve to guests who you want to show respect to. Also see Shevet Halevi 3:26 and 5:32 where Rav Vosner says even where you have wine, chamar medina can be used because in the times of the gemara, wine was far more widespread. Today however, most people do not drink wine so often so other drinks are not inferior to wine for kiddish. ↑ Sh"t Igrot Moshe 2:75 rules that soda is just like water and can not be used for Kiddish. ↑ The Gemara Pesachim 117b has a dispute between the elders of Pumpedita and Rava in tefillah whether you should say Mikadesh Yisrael or Mikadesh Yisrael Vehazmanim on Yom Tov. In Kiddush everyone agrees that you should recite Mikadesh Yisrael Vehazmanim. Magen Avraham 487:1 writes that if in Kiddush someone only say Mikadesh Yisrael he didn’t fulfill his obligation. Kaf Hachaim 487:17 and Zichron Yonah Avodat Halevim 30:1 agree. ↑ Regarding Tefillah, Shulchan Aruch 487:1 and Mishna Brurah 487:5 hold that the Shabbat conclusion doesn’t fulfill the obligation of the Yom Tov one. Mishna Brurah holds that it can be fixed within a toch kdei dibbur. Magen Avraham 487:2 implies that the same is true of kiddush. Zichron Yonah 30:2 writes so explicitly. ↑ Regarding Tefillah, the Magen Avraham 487:2 writes that mentioning Yom Tov in the middle is sufficient even with a wrong conclusion but he seems to retract that opinion. Mishna Brurah 487:4 concludes that one doesn’t fulfill one’s obligation. Zichron Yonah 30:2 applies this to Kiddush. ↑ Shulchan Aruch 487:1 writes that if one said Shabbat kiddush on Yom Tov one doesn’t fulfill one’s obligation. Zichron Yonah 30:6 writes that if on Shabbat Yom Tov one said either the Shabbat or Yom Tov kiddush separately and not both one didn’t fulfill one’s obligation. Rivevot Efraim 4:117 agrees. ↑ Regarding Tefillah there is a dispute between the Knesset Hagedola who holds that concluding with one of the two conclusions is sufficient and the Pri Chadash who disagrees. Biur Halacha 487:1 makes a compromise and says that if he mentioned Shabbat that is sufficient but if he only mentioned Yom Tov that is insufficient. Kaf Hachaim 487:20 holds that in all cases out of doubt he shouldn’t repeat the bracha. Zichron Yonah 30:7 applies this discussion to Kiddush. ↑ Leket Shichacha Vtaut p. 397 writes that the Bet Yehuda 4 holds that one fulfills one's obligation if one mentioned Yom Tov but just didn't mention which Yom Tov it was, but the Mishna Brurah 427:11 holds that one doesn't fulfill one's obligation. Shemirat Shabbat Khilchata v. 2 p. 110 holds like the Mishna Brurah. This page was last edited on 4 April 2019, at 18:26.